Physical Topology is depicted below. It is comprised of three QFX5100 devices running JunOS version 17.1. Two EX switches simulate customer CE devices. VXLAN encapsulates Layer 2 Ethernet frames into IP before carrying them across the network. The means that end-to-end IP reachability needs to be established between all Virtual Tunnel Endpoints (VTEP). 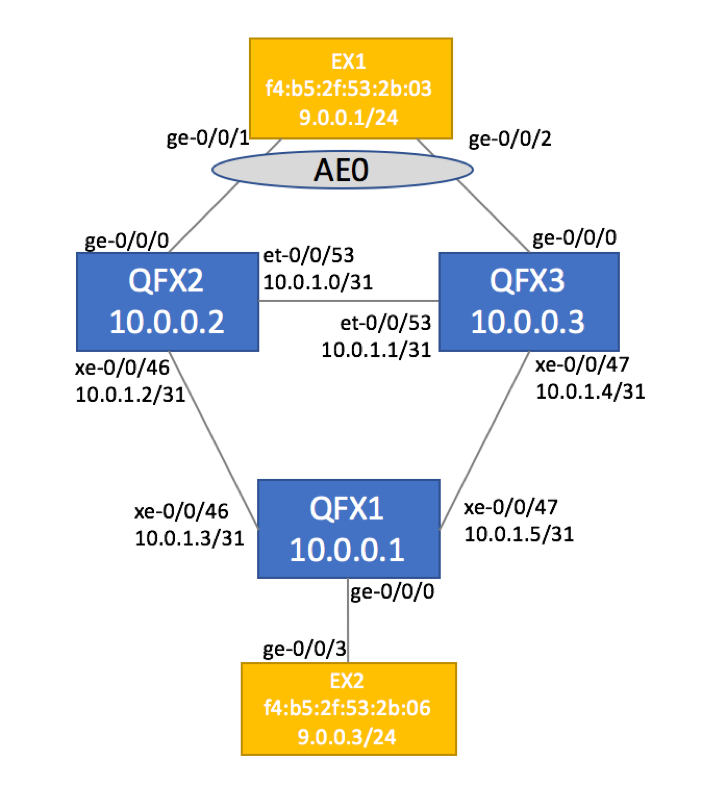 In our scenario, QFX1, QFX2 and QFX3 will serve as VTEPs, so we’ll start with establishing Loopback IPs are reachable. EVPN relies on BGP to exchange MAC and IP Reachability information. We will configre IBGP between our QFX devices and activate address-family EVPN. With EVPN fully configured, we can apply VLAN-specific configuration to physical ports. Depending on port connectivity scenario (single-homed vs multi-homed CE), there will be a slight difference in the configuration. Single-Homed CE only requires basic interface configuration. Multi-homed site requires Ethernet Segment Identifier (ESI) configuration that should be unique per site. This ESI value should be unique for each site. We are also configuring Aggregate Ethernet interface. Although we could have placed ESI configuration on the physical ge-0/0/0 interface, AE will be useful in the future if you decided to augment the capacity and add more links to customer’s site. Creating AE bundles with a single link is a common practice employed by many service providers. In order to validate the service and make sure that Ethernet Switching tables are populated, we will run End-to-End ping test between CE Devices. Assuming that Ping was successful, you can check EVPN-related information on your QFX devices. Remote MAC for single-homed CE (EX2’s MAC on QFX2 and QFX3). Juniper uses logical VTEP interface in this scenario. Remote MAC for dual-homed CE (EX1’s MAC on QFX1). Juniper uses virtual Ethernet Segment Identifier (ESI) interface in this scenario. You should observe Type 1, Type 2, Type 3 and Type 4 routes as shown below. Single-homed site advertisement as signified by ESI = 0.